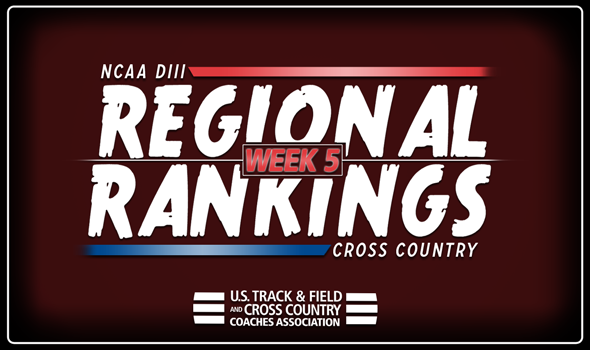 NEW ORLEANS – For the second time this season, it was a quiet week in the NCAA Division III Cross Country Regional Rankings. The most recent Regional Rankings, released Tuesday by the U.S. Track & Field and Cross Country Coaches Association (USTFCCCA), saw very few changes from the previous week – but there is a new No. 1 women’s team in the West Region. Expect a few more changes next week following the conclusion of the Kollege Town Sports Cross Country Invitational this upcoming weekend, hosted by UW-Oshkosh, which is the de facto Pre-National Invitational for NCAA DIII. The women’s Pre-National Invitational begins at 9:40 am, with the men’s race starting 40 minutes later. There were no changes to the top-5 this week in the men’s rankings: RPI is still No. 1, followed by No. 2 SUNY Geneseo, No. 3 St. Lawrence, No. 4 RIT (led by Otto Kingstedt, the National Athlete of the Week) and No. 5 Rowan. There were no changes to the top-5 this week in the women’s rankings: SUNY Geneseo is still No. 1 after winning the Houghton Highlander Invitational this past weekend and is followed by No. 2 St. Lawrence, No. 3 RPI, No. 4 Rochester (N.Y.) and No. 5 Vassar. There were no changes to the top-5 this week in the men’s rankings: Wartburg is still No. 1, followed by No. 2 St. Olaf, No. 3 Carleton, No. 4 St. Thomas (Minn.) and No. 5 Loras. There were no changes to the top-5 this week in the women’s rankings: Carleton is still No. 1, followed by No. 2 Nebraska Wesleyan, No. 3 Wartburg, No. 4 St. Olaf and No. 5 St. Thomas (Minn.). There were no changes to the top-5 this week in the men’s rankings: Calvin is still No. 1, followed by No. 2 Otterbein, No. 3 Case Western Reserve, No. 4 Trine and No. 5 John Carroll. There were no changes to the top-5 this week in the women’s rankings: Hope is still No. 1, followed by No. 2 Calvin, No. 3 Otterbein, No. 4 Allegheny (Pa.) and No. 5 Case Western Reserve. There were no changes to the top-5 this week in the men’s rankings: Haverford is still No. 1, followed by No. 2 Carnegie Mellon, No. 3 Johns Hopkins, No. 4 Dickinson (which won the DeSales Invitational) and No. 5 Stevenson. There was a small change to the top-5 this week in the women’s rankings: The top-4 teams are still the same in No. 1 Johns Hopkins, No. 2 Dickinson, No. 3 Carnegie Mellon and No. 4 Swarthmore. Misericordia swapped spots with Haverford and comes in at No. 5. There were no changes to the top-5 this week in the men’s rankings: North Central (Ill.) is still No. 1, followed by No. 2 UW-La Crosse, No. 3 Washington (Mo. ), No. 4 U of Chicago and No. 5 UW-Stout. There was a small change to the top-5 this week in the women’s rankings: Washington (Mo.) is still No. 1, followed by No. 2 UW-Eau Claire and No. 3 Wheaton (Ill.). U of Chicago moved into a tie at No. 4 after beating North Central (Ill.) this past weekend at the Eagle Invitational hosted by Benedictine (Ill.). There was a minor change to the top-5 of the men’s rankings this week: No. 4 MIT and No. 3 Amherst swapped spots after the former’s strong effort at the All-New England Championships this past weekend. The Engineers narrowed their 1-5 spread to 37 seconds. Other than that, not much is different: Williams is No. 1, followed by No. 2 Middlebury, while Bowdoin is slotted in at No. 5. There were no changes to the top-5 of the women’s rankings this week: MIT is still No. 1, followed by No. 2 Williams, No. 3 Tufts (led by Natalie Bettez, the National Athlete of the Week), No. 4 Middlebury and No. 5 Brandeis. There were no changes to the top-5 of the men’s rankings: Rhodes is still No. 1, followed by No. 2 Berea (Ky.), No. 3 Emory, No. 4 Washington and Lee and No. 5 Christopher Newport. There were no changes to the top-5 of the women’s rankings: Emory is still No. 1, followed by No. 2 Lynchburg (Va.), No. 3 Centre, No.4 Washington and Lee and No. 5 Trinity (Texas). There were no changes to the top-5 of the men’s rankings: Pomona-Pitzer is still No. 1, followed by No. 2 Claremont-Mudd-Scripps, No. 3 UC Santa Cruz, No. 4 Occidental and No. 5 George Fox. Pomona-Pitzer took over the top spot in the women’s rankings this week after getting Lauren Hamilton back into the mix. Hamilton is a former All-American, who should bolster the Sagehen corps. Former No. 1 Claremont-Mudd-Scripps fell to No. 2 and is followed by UC Santa Cruz at No. 3, Occidental at No. 4 and Colorado College at No. 5.